It’s officially been a week since Honey Bunches came back to me, and he has settled in rather flawlessly. It feels like we have literally picked up right where we left off last summer with long walks in the woods, excited home comings, and snuggles on the couch. Otis is reminding me every day what a great dog he is. He is fine for me to leave home alone, he is housebroken and crate trained, he is literally perfect on the leash, he is super laid back – and the list goes on. He becomes very attached to his “person” and follows them all over the house, so he will be perfect for someone looking for a close companion. I am hoping to work with him to try and build his confidence so he doesn’t feel like he needs to rely so heavily on his guardian, but for now it’s clear he is most happy when he is by his human’s side. But, despite being one incredible pooch, Otie has been rehomed twice at no fault of his own. Like I mentioned on Thursday, he does have two buttons that push him too far out of his comfort zone: kids and living with other dogs. I want to stop here for a moment and clarify that Otis’ fears do not manifest themselves in any aggressive behavior. Animals have two instincts when it comes to fear: fight or flight. The “fight” instinct is shown through what is called “dog reactive” behavior because they feel like they need to stand up to whatever is upsetting them through barking, growling, lunging, etc. In dogs like Otis, the “flight” method is preferred – hide and run for cover or cower and hope the scary thing goes away. In these situations it is clear he is miserably unhappy. In my house, free of dogs and kids, Otis is a bubbly, outgoing, and happy-go-lucky dog. He finds so much joy in just being with you – whether it is on the couch or on a walk. His tail seems to never stop wagging in this adorably odd circular motion, and grass rolls are his favorite thing. 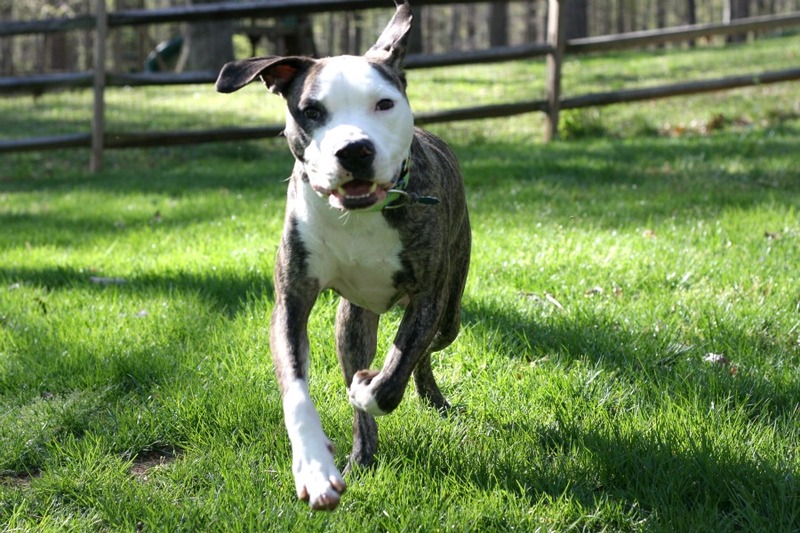 He is playful and energetic and all the things a well-behaved two year old dog should be. 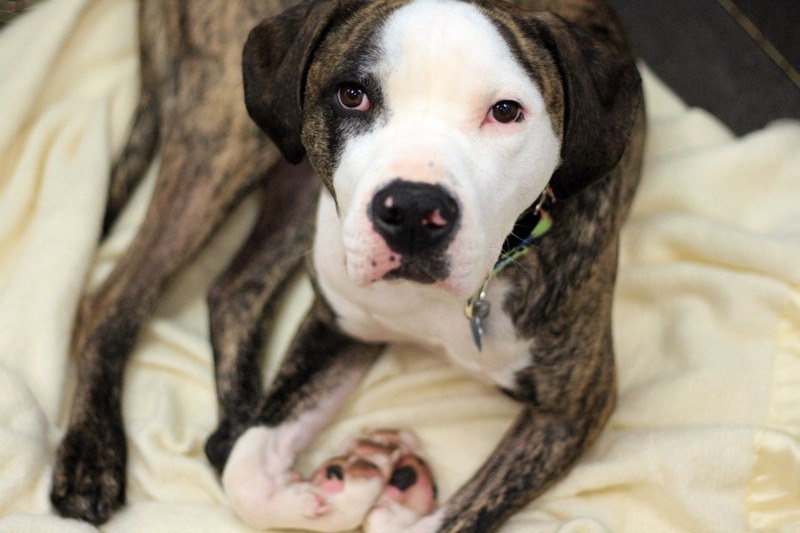 Like I’ve said before: whoever ends up adopting this dog will be one lucky duck. I know I mentioned last week that Otis has got a lot of learning to do about being a happy dog again, but he’s already worlds past where I expected him to be so a lot of my work is done. While he is with me we are just going to enjoy the time we have together by further perfecting his manners and finding him the best family we possibly can. It’s going to be hard to give this one up! If you are interested in adopting Honey Bunches of Otis, email peacelovefoster@gmail.com. 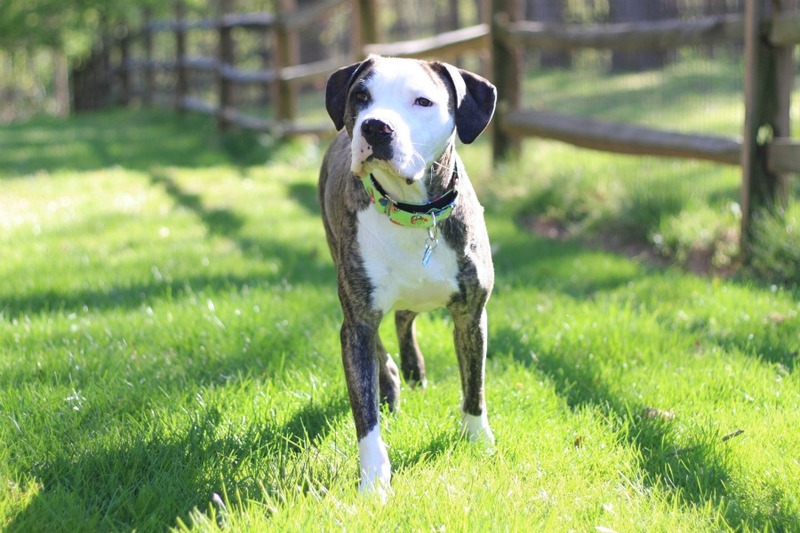 This entry was posted in Dog talk, Otis, Rescue/Humane Society, Uncategorized and tagged american bull dog mix, brindle dog, dog behavior, fight or flight, for adoption, mutt, Otis. Bookmark the permalink. What a sweet guy. Working with our first ever foster Delaynie, I can see how environment really can bring out a different side of a dog. Laynie came from another foster with 10+ other dogs, several cats and children, and was just a ball of excitement all the time. In our house, with just one other (calm) dog, no kids or cats, she has learned to relax and be more calm. It is great to see that you have identified that will Otis and I can’t wait to watch more of his progress and see his personality shine! ahhh the “flight” ones always get me. :( i can’t wait to meet Otie. give him a face-smush for me. I love how his paws are folded in that first picture! Too cute! It sounds like he just likes a quiet life- nothing wrong with that!